(Newser) – Dallas Seavey has won his second Iditarod Trail Sled Dog Race in a climactic finish that saw him speed past two competitors in the final 77 miles. During that span, Seavey, 26, passed Aliy Zirkle, who came in second, as well as four-time winner Jeff King. Zirkle has now come in second three years in a row, the AP reports; she finished a few minutes behind Seavey. 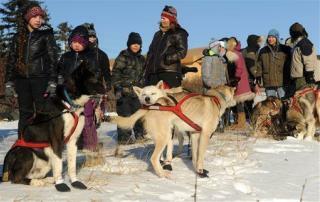 It was one of the race's tightest finishes ever, the Anchorage Daily News reports. IN MY OPINION! HOW LOW CAN WE GO AS HUMANS TO USE ANIMALS IN SOME KIND OF RACE!! MY GUESS IS REAL LOW!! IF HE WANTED TO WIN THIS IDITAROD!! WHY DON'T HE PULL THE SLED HIMSELF!! NOW THAT WOULD BE A FEAT!! (an achievement that requires great courage, skill, or strength IN ONESELF!! WITHOUT THE USE OF A ANIMAL LIKE A DOG!! PERIOD!! Good win by a real man and a good second place by a real woman. These people, fighting nature and working their dogs day in and day out, amazing, just amazing. They don't make many like that anymore. Sounds to me like he & his dogs are a steel team.